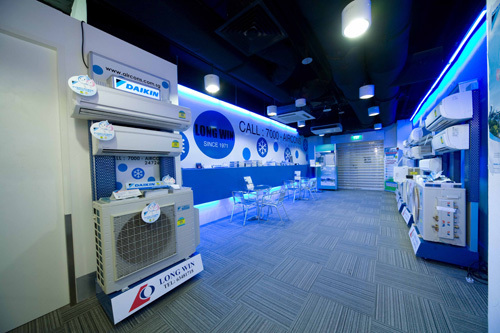 Long Win Aircondition Engineering Pte Ltd, for the past 30 remarkable years, has been enhancing the life style of people in Singapore with our extensive range of air-conditioners. Supported by both our committed and dedicated management and technical professionals, we ensure that all customer satisfactions are well met with high integrity. We are committed to uphold the goodwill of the company by ensuring. Our positioning which distinguished us from our competition for the past 30 years is the type of material used by us. Only material approved by PSB are used to ensure conformity with all trade standards and regulation set out by the relevant authorities. A good example is the type of copper pipe used. We are using, copper pipe. It is notably more expensive than the rest of the brands in the market as it is important directly from Japan. As for insulations only class ‘1’ or ‘0’ armaflex are used, we strongly insist on top quality material even during the economy downturn. This is because we believe that the trust and confidence earn by giving our customers the best finished product will allow us to reap the awards in the long run. With vision, courage and foresight, we are to remain among the BEST in the industry with notable reputation for consistently delivering quality products, maintenance and installation that are supported by superior personalised services. And to develop our staff to their fullest potential through constant training in order to meet the growing expectations of our customers. Copyright © LONG WIN - Aircondition Engineering Pte Ltd.